Sleep is a topic I catch many hockey players off guard with, mainly because their coaches haven’t brought it up to them in any serious way yet so they have underestimated its role in athletic development and physique enhancement. When discussions come up involving athletic performance enhancement, the two main topics are training and nutrition, yet sleep is equally as pivotal. If your sleep is off, you’re setting yourself up for a lot of problems with your recovery; and if you’re not recovering properly from the demands of your on and off-ice work then you’re negatively impacting all aspects of body composition development and performance. In my fatigue management blog series, I made it very clear that sleep was your #1 tool for recovery because without sleep it doesn’t matter how many calories, supplements or other fatigue management strategies you use. You will still be tired, you will still be under recovered, you still won’t be prepared for optimal exercise, and you will still have a disrupted endocrine and immune system. Here’s the thing, sleep is supposed to be natural, not difficult. This is something you shouldn’t even have to think about. If you’re having big troubles falling asleep and staying asleep at night this is a major issue, but without knowing you personally I cannot offer my opinion on why I believe you are running into these issues. That requires a series of questionnaires and some potential lab work — or sometimes, just a little common sense. Yes i’m looking at you hockey player who has three beers before bed and stays on his phone all night. But what I can do for you is discuss why sleep is so crucial to physical and athletic development and offer some simple strategies to increase the quality of your sleep that will work for everybody who reads this. Most all systems in the body become anabolic during sleep. This includes your bone, immune, muscle, and endocrine systems. During the night the bones are building up and remodeling themselves, muscle tissue is being repaired and added to the body, and various systems in the body are producing hormones such as growth hormone (GH) and testosterone. Very important note here, the gym is where you create the stimulus for growth — but much of that actual growth occurs during a quality night’s sleep. Studies have shown comparing 5 hours of sleep to 8 hours that the groups who consistently had less sleep had higher concentrations of catabolic (muscle breakdown) hormones such as cortisol and lower concentrations of anabolic (muscle building) hormones like testosterone and IGF-1. 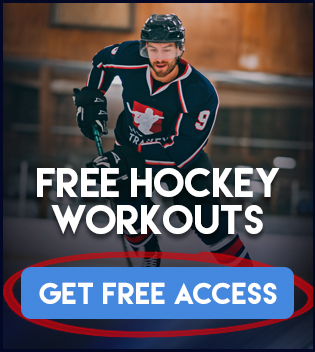 Additionally, neurotransmitter pools are being restocked which contribute to all sorts of different metabolic benefits but most of which being relevant to hockey athletes include increased motivation, drive, focus, speed of thought, speed of muscle contraction, learning, memory, attention span, vasodilation, and reduced time to fatigue. This combination of neurotransmitter benefit contributes not only to physical performance, but also mental performance on and off the ice. It’s important to care about mental performance as well because the more “in the zone” you can be, the better you can read the ice and play the game you want to play. The performance benefits are somewhat common sense. Yes of course there are many cellular intricacies that go into the “why” behind that but just looking at it bluntly, if you’re one of these guys who is chronically tired — your performance is going to suffer. There’s no way around that. But from a body composition stand point it isn’t so common sense because when most think of making changes they look to training and nutrition. Which don’t get me wrong, is a totally great place to start, but when viewing total potential for change from a whole-picture point of view leaving out sleep is leaving out a big chunk of what you could otherwise be accomplishing. Let me explain, sleep’s effect on the body’s Respiratory Exchange Ratio (RER) is one of its biggest noticeable negative effects that can destroy your physique and performance. In the research, RER is a way in which to measure the primary source of your body’s fuel. If you have a low measured RER, you are burning a greater proportion of fat to fuel your energy needs. If you have a high RER, your body is burning a greater proportion of its own lean tissue to meet the energy demand. Most of us are familiar with Basal Metabolic Rates (BMR). For those of us who are not familiar, a BMR value is the number of calories at which you burn per day just to sustain normal bodily function. This is the rate of energy the body uses while at rest to keep vital functions going, such as breathing and keeping warm. This can vary quite a bit between individuals based primarily on size. For example, a 300lbs strongman competitor is going to have a higher BMR to keep his body functioning on a day to day basis than a 90lbs gymnast. Where RER values come into play is they determine how much of this base daily calorie burn is coming from either fatty tissue, or lean tissue (muscle, glycogen stores). 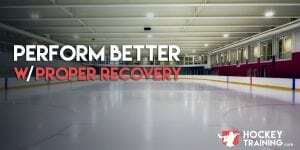 Hockey players are incredible athletes and to compete at a high level we want to have the greatest lean muscle tissue to fat tissue ratios so optimizing RER is something of significant importance. How does sleep tie into all of this? Research has shown low levels of sleep (5.5hrs nightly) significantly raises RER. Meaning, if you are consistently getting poor sleeps you are shifting the majority of your daily calorie burn to lean tissue as opposed to fatty tissue. Ideally, we would have a low RER value to optimize fat burning while keeping your lean muscle mass. A decreased sleep level raises your RER value without affecting your metabolic rate. Meaning, if your daily calorie burn average is 2500 calories, it is going to stay that way with or without a bad sleep. So if you get a bad sleep and your RER raises, your metabolism won’t lower to offer up some damage control. You will just lose that much more lean tissue. Not good. To put things into perspective and give some examples. Let’s say you have an average calorie burn of 2500 calories per day. If you have a low RER value, 2000 of that could be coming from fat and only 500 from lean tissue. Whereas if you have a high RER value, 1250 could be coming from fat at 1250 from lean muscle tissue. Not a good trade off if optimizing your athletic potential and body composition are in your sights. Why should we actually care about this? If you’re trying to lose weight, do you want to lose 50% body fat and 50% lean muscle tissue? Or would you rather lose a lot more body fat than lean muscle tissue? If your priorities are straight and you’re looking to keep and/or build as much lean muscle mass as you can while decreasing your body fat percentage, the latter is the obvious option and getting a great night’s sleep is an effective tool to use. This also works in the other direction. If you’re trying to gain lean muscle mass and you sleep poorly on a regular basis you’re going to be spinning your tires in the mud, going nowhere fast. You will simultaneously have a higher amount of catabolic hormones, a lower amount of anabolic hormones, low neurotransmitter pools, and a high RER value. Good luck with that! We need the immune system firing on all cylinders because it is the immune system that is helping you recover from exercise and from all the practices and games you do. Any intense physical activity is a knock at the immune system and the immune system has to recover from the exercise bout and still try to protect you from illness while it’s at it. The more intense physical bouts you partake in, the more hits you’re taking to your immune system. A real-life example on immune function from exercise can be brought in from fighters getting ready for the big fight. So often fighters go into a fight sick or get sick 1 or 2 weeks out from a fight because they have been training so hard during training camp that their immune system could only keep up for so long. A good diet, proper fatigue management, and a good night’s sleep are the best tools to fight this immune depression. Now we know we need the immune system to recover you from training and from your on ice activity, but we also need it to make you a better athlete. How does my immune system make me a better athlete? Well, the more often you get sick the less you can train which will directly affect your skill development. Additionally, the more often you get sick the more practices and games you will miss which over time will directly affect your skill development. Research has shown in the area of sleep quality and immune system function that if you sleep 5hrs or less per night that you are 9x more likely to get a cold or flu. Research is also unwinding a vicious cycle between fat gain and sleep, going in both directions. Poor sleep quality increases levels of body fat while increased levels of body fat lead to decreased sleep quality. Not a cycle you want to be in. Beyond this, another study with more than a 1000 volunteers found that those who averaged 5hrs of sleep a night or less had also decreased their leptin and increased their ghrelin — but also increased their Body Mass Index (BMI) 3.6%. 3.6% may not sound like a lot to many of you but these results were found irrespective of the subjects diet or exercise habits. Meaning, just sleep alone showed an increase in BMI no matter how they ate or trained. These are just a couple of studies showing this correlation but there are plenty more where that came from. And if that wasn’t enough, decreased sleep can also disrupt blood sugar regulation as well with one study demonstrating that cutting back sleep to 4hrs saw a 40% longer rate to regular blood sugar after a high carb meal alongside a decreased insulin response of 30%. These numbers are huge and given the fact that carbohydrate intake and timing are a major part of proper meal planning for hockey athletes it makes a big difference to you directly. 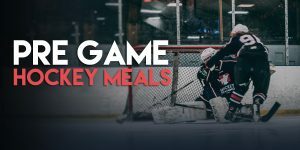 If you’re a hockey player and you’re motivated towards making the best progress possible in your game and with your physique, then carbs should be in your meal plan in the right doses and at the right times. But even if your meal plan is bang on point, poor sleep can disrupt how well you manage these sugars in your bloodstream which can lead to unnecessary inflammation. Now that we have gone over some important factors as to why you should care about sleep and what sleep can do for your muscle building, fat loss, and athletic performance — it’s important to also talk about some strategies in which you can use today to start taking advantage of this. • Try to calm down at night time. Nobody ever went to bed relaxed and ready to properly sleep just after watching UFC or action movies. Not going to happen. Reading leisurely (not researching or planning) is a great way to calm down and prime your body for rest. One last thing that is important to note is that there is no optimal amount of sleep, there is only an optimal amount of sleep for YOU. Some people only need 7hrs, some people need up to 10hrs per night. The idea is to get enough to where you feel best. If you can function throughout the day at a high level without massive doses of caffeine, then you’re probably good. But if you are chronically under rested it should be your #1 priority before ANYTHING else. A good rule I like to use is that you should never wake up with an alarm. This gets people out of the idea of thinking they have to sleep 8 or 9hrs. If 7hrs is good for you and you’re not being interrupted by an alarm doing this, by all means go for it. It should also be noted here that “more is better” isn’t true. You will not be gaining any advantage sleeping 12hrs a night if your body doesn’t need to for adequate recovery. Simply waking up without an alarm is ensuring you are doing it right. It should also be noted here as well that NSAIDs, beta-blockers, birth control, benzodiazepines, calcium channel blockers and SSRI’s have all been associated with depleting the body of melatonin which can contribute to a decreased sleep quality. Ultimately, the results you get with your physique and the results that you get with your game on the ice depend on how well, or how poorly you sleep because sleep is connected to so many contributing factors that are absolutely necessary to reach your true potential.